The N.C. Chronicles. 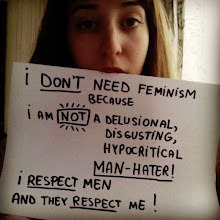 : Feminism media...the hypocrisy of a closed in world. Feminism media...the hypocrisy of a closed in world. and men for their talents, connections and money. We see this in advertising, the sexier the woman, the more profit is made. that is the hypocrisy of the media, they say one thing but advertise another. but the reality is it wants to cherry pick the good stuff - without doing the work. In fact they are actively promoted and protected over men. However it is tough, it's not fun and games, it requires many skills. So feminism has become a parody of what it set out to achieve. then complaining we oppress them. their white knight personality extends way beyond the opening of doors. Those around them are just too weak to bring it to their attention. This is a simple issue to address. Just treat feminists like men, equal to men that is, but offer ladies chivalry. Ladies enjoy chivalry and don't find it sexist at all. Do that and it becomes a win-win situation. Got this from the telegraph, can't find the link, but I thought it was a good point. I did switch women to feminists, and a couple of other words. or subscribe as a whole to the feminist ideology anymore. Weak minded people who depend on others to find their strength do, but those who are "secure" no longer accept this hate-filled group of cat lovers with an inferiority complex as their representatives.